SPM EQUIPMENT'S Lowering Cradles are used in line travel operations. The Polyurethane / Nylon rollers evenly distribute the pressure on the pipe, avoiding the risk of egging. The use of Polyurethane / Nylon rollers also eliminates the risk of damage to the pipe coating that can be caused during the use of regular metal wheel cradles. SPM Lowering Cradles provide the comfort of smooth operation. The Polyurethane / Nylon rollers ride easily over weld seams and do not hang up. Disassembling the Lowering Cradle is easy and the volume can be reduced to a convenient size for storage and transport. SPM Lowering Cradles comply with all applicable standards. By using multiple Polyurethane / Nylon rollers instead of the Metal wheels, the pressure on the pipe is evenly distributed and the risks of damaging the pipe coating and deformation of the pipe are eliminated. The Rollers ride easily over weld seams and do not hang up. The use of high quality materials throughout the design ensures maximum performance. SPM Lowering Cradles are equipped with heavy duty Polyurethane/Nylon rollers with double ball bearings. The Polyurethane/Nylon wheels do not deform under the weight of the pipe or during storage, as the high mechanical strength of the material easily withstands the stresses it is subjected to. The special damping characteristics of the rollers result in an excellent dynamic load-bearing ability and offer outstanding performance. Disassembling the Roller Cradle reduces the volume to a convenient storage and transit size. The high safety factor in the design and choice for materials such as Frame, Wire Rope, Clamps, and Rollers etc. ensure safe operation. We SPM Equipment, from 2016, are serving our customers by manufacturing and wholesaling high-quality Pipe Clamp & Rollers. Offered products range consists of CS Pipe Line UP Clamp, Pipe Roller, and Blasting Plug. All offered products are designed using best quality raw material and innovative technology under the supervision of quality controllers in adherence to quality norms. This product range is highly required for their features like high performance, sturdy design, lightweight, easy to use and longer life. To carry out the business functions in a smooth and efficient way, we have developed a modern infrastructure facility and installed it with all required equipment and tools. This infrastructure is skillfully managed by efficient team members, who are the experts in their field. Our infrastructural facility is properly segregated into enormous sections for hassle production process. 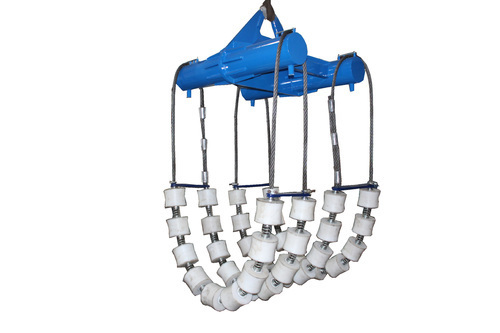 We are able to deliver pipe clamp & rollers on time at client’s end with a wide distribution network.